In the last post I talked about new features offered by Creative Cloud. Based on some of the more passionate comments, it's clear that new features aren't the defining aspect of CC; you want to hear about the price. Earlier this year Adobe announced that they're no longer offering boxed versions of the software, that it will now be a subscription service. Many artists were outraged by this news, and I went as far as signing an online petition to show my disapproval. In short, I was ready to hate CC. That was six months ago, and since then I've had a lot of time to think about and experiment with the new software. Today's post will explain my thoughts on the matter. In the United States Photoshop CC costs $20 / month. If you're a current Photoshop customer (CS3 and beyond), it's $9.99 a month - although you need to sign up before Dec 31st to get this price. Let's compare this new price to the traditional Photoshop model: $700 plus an additional $200 for each upgrade. For my comparison I've assumed a user upgrades every 4 years. 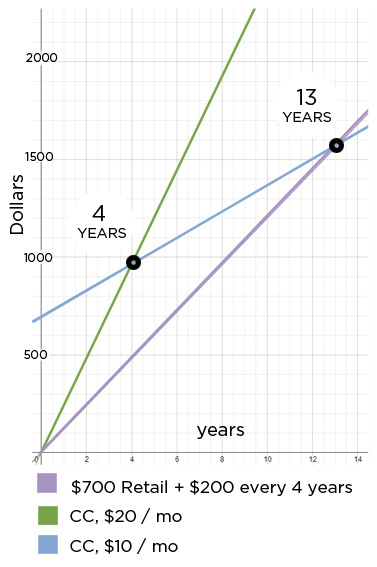 The intersections on the graph show at what point the CC subscription becomes more expensive than the traditional model. At $20 / month, CC is cheaper for the first four years. At $9.99 a month it's cheaper for the first thirteen years. How is the software different than it used to be? The short answer is: not much. The "Cloud" format offers a few extra features, though they're largely throw away -- the primary difference is the frequency of updates. As a subscriber, you'll get updates every few weeks instead of waiting for a major release. Beyond that, it's the same old Photoshop. Sadly, digital painters seem to get fewer cool new features than photographers do. This issue has been a very contentious one for the Photoshop community. As I mentioned earlier, I was ready to hate it - and would have told you all about it in this post. I think, though, that we're been asking the wrong question. Ask yourself: "is Photoshop a valuable part of my artistic life or career?" If so, $20 a month seems much more reasonable. $10 is undeniably a bargain. Listen: art is expensive! A tube of blue oil paint (pictured left) costs $43. The average oil painter certainly pays more than $20 per month on supplies. If you're the sort of user that is satisfied to install Photoshop CS1 and use it for a decade, than CC is not for you. If you anticipate being that sort of user and don't have a copy yet, go grab a CS6 box for $700 while they're still in stores. For everyone else, it's a question of "Adobe or Open Source" (I'm looking at you, Gimp). For beginners this is great news! There's never been a cheaper (legal) way to use Photoshop. At the end of the day, there's not much choice in the matter: Adobe has switched to a subscription model. It's likely that the pricing will change over the years, but don't count on boxed versions coming back anytime soon. I wish there was a strong competitor to Photoshop, but sadly... there isn't. But lets face it: Photoshop is extremely powerful, stable, software. Frankly, that's worth $20 (or $10) a month. Seriously, we want to know! I've seen a lot of angry rhetoric about this issue. I haven't seen a lot of alternatives. If you're angry about the switch in business model, what's the next step for you? We want to hear about it in the comments. The price is likely too high for certain segments of the Ctrl+Paint population, and we'd love to hear useful alternatives. We don't need to hear more arguments about Adobe's pricing. The internet has done plenty of that already, and Adobe has clearly made up its mind.